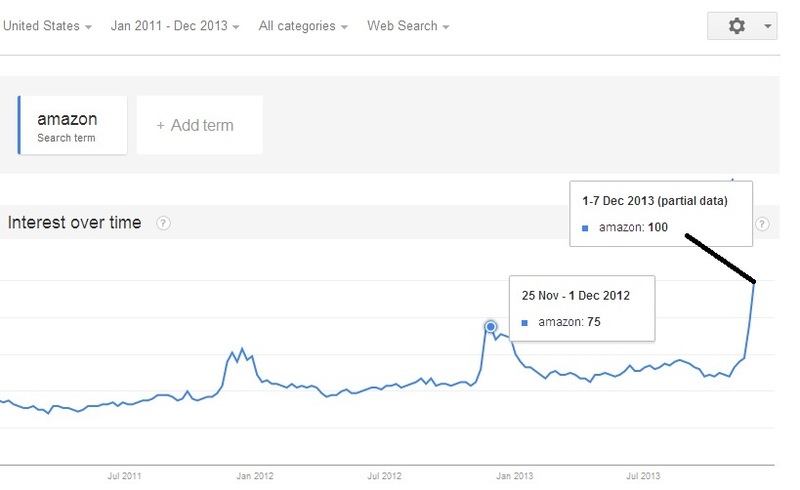 Search volumes for the term Amazon exploded on Cyber Monday 2013; they were approximately 133% of Black Friday and Cyber Monday 2012’s volumes put together. 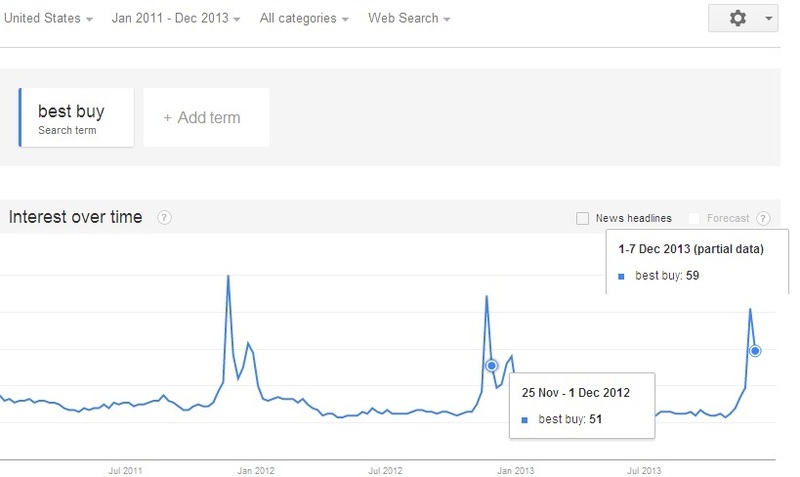 The chart below depicts search volumes on a weekly basis, thus the week of November 25th to December 1st 2012 encompasses search volumes for both Black Friday and Cyber Monday whereas the search volume for December 1st to 7th, 2013 encompasses search activity for Cyber Monday 2013 only. 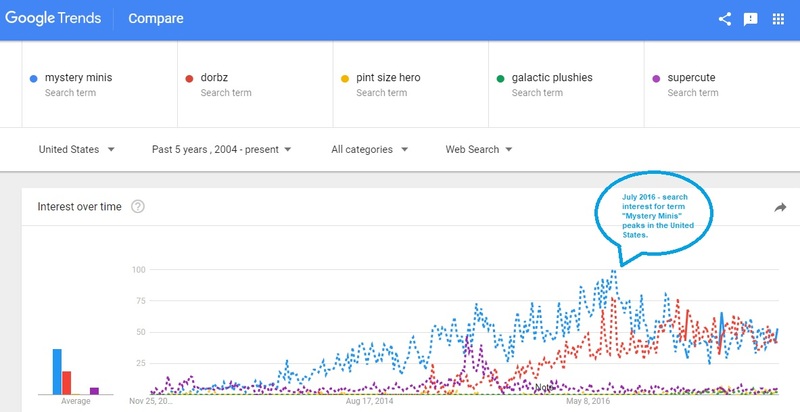 Given that the 2013 search volume for these dates have completed dwarfed that of last year, I would suspect that this sets a very positive tone coming into the holiday season. Amazon’s stock price has seen an appreciation of roughly 35% since September 2013 and it shows no signs of cooling off and the search volume definitely confirms this. The Best Buy search volume trend can be interpreted in a number of ways: The company has out rightly voiced their concerns over their physical storefronts and their increasing irrelevancy. In an attempt to mitigate this, Best Buy has declared a switch towards an online storefront similar to that of Amazon. Thus year over year search volume changes showing positive on Cyber Monday and negative on Black Friday would suggest that their plan to shift to an online marketplace is working. This is not to discount the significant decrease in year over year in search volumes on Black Friday as the company still derives a large chunk of their revenues from a physical location. Again, as a reminder, search volumes are not a 1-1 ratio with sales, but could definitely be treated as a leading indicator of what to expect come next earnings release. It should also be noted that consumption of goods and services over the web has been growing at a significant pace since the inception of the internet; this transition to online consumption has been supercharged by the advent of mobile devices which should always be considered when reviewing search volume trends. Walmart search volume saw an increase on Cyber Monday in comparison to the same period last year; this was preceded by Black Friday search volumes greater than the year prior. Walmart share price took a bit of a hit over the past three days but it seems like google trends confirms that this will be short-lived and that the price has more appreciating to do.